CJ had her second valentine exchange with her classmates this year. Last year we bought flimsy Punch-out Backyardigan valentines from Walmart. This year I was determined to do Homemade Swap cards. For Valentine's Day, we picked up My Heart Is Like a Zoo book from the library. Little Family Fun had a blog post about this book at her Blog. When I saw her post the thought of Valentine swap cards came into my mind and I put a hold on the book. 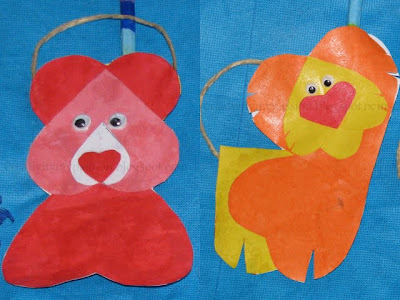 We made Bear hug and Friendly roar valentine cards. Instead of just being a swap card,I wanted the card to hold the valentine Candy and the Rainbow pencil. So I added a heart pouch, a handle and converted them into a small handy goodies Bag. I should have posted these cards before Valentine's Day but things didn't go my way and I was unable to post it. But anyways these cards/bags could be a super Birthday party favor, may serve as a Thank-you card. They can also be made for Grandparents, Parents Birthday, Mother's day/ Father's day. For our Friends circle kids, we made lions for Boys and Bears for Girls. Hearts and hearts! What color do you want? Recently we bought a Cookie cutter set from Amazon and it came handy for this project. This cookie cutters and stencils are great. They are sturdy and heavy plastic so no worry about rusting. It works good to cut bread too. Because of the Jumbo size it serves multipurpose in kitchen and Crafts! 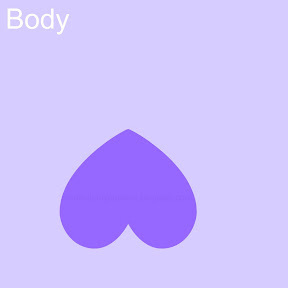 I used the Heart stencil for smaller hearts and cookie cutter for bigger hearts. Each lion is made of 6 hearts. The Mane and the body is made of same size hearts. For the Face, Cut a heart smaller then the Mane. 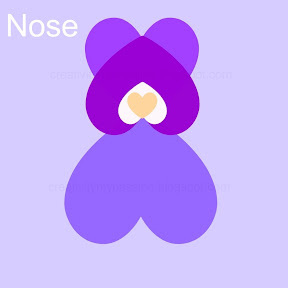 For the Chin and the Nose cut hearts smaller then the Face. I used Orange Color construction paper for the Mane and the front legs, yellow color for the Chin, Face and Back legs, Red for the Nose. Glue a Jute string as tail of the lion and Googly eyes to the Face of the lion. I found this Idea of making beautiful heart pouches from the Zakka's life blog. One of my favorite recycling and green projects blog. All you need is an recycled envelope! Draw a heart shape in one corner of the envelope. The construction paper lion looked very flimsy so I glued the lion to a card stock and then glued the heart pouch to the backside of the head. All set! Now you have a heart pouch to be filled with Candy/Lollipop or Special Notes/Wishes. Ready for the Friendly Roar! 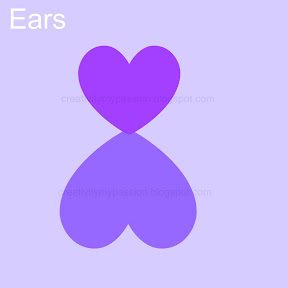 For each Bear, For the Body you need a big heart, For the Ears and the Face- two hearts of same size. 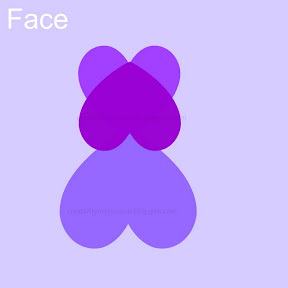 For the Chin, a heart smaller then the face and For the Nose, a heart smaller then the Chin. I used dark Pink/Dark Blue construction paper for the Body and the ears, For the Face-Light pink/Light blue color, For the Chin- White, For the Nose - Tan color. From lesson learned in making the lion, For the sturdy feel I glued the Hearts to Construction paper. This method was much easier and I was able to make 3 bears at a stretch. I made the Bear valentines, the night before valentine's Day and I didn't picture the steps. So I played around Picnik software to create the below images. Glue the Big Heart on to the Construction sheet. I glued 3 hearts with equivalent spacing. So that I can create 3 bears at a time. Glue the Googly eyes and the Bear is ready. Cut the Bear Outlines from the Construction paper. Glue on the recycled envelope heart pouches to the backside of the head. Add-on yarn or Jute String to create a handle. 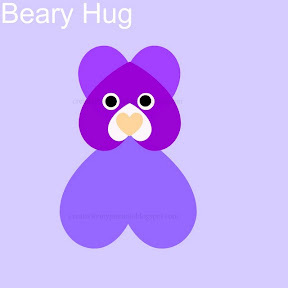 Ready for a Bear Hug! Aaaah not only do I adore heart crafts, but what a great idea to use them for the goodie bags! Fabulous!!! Thank you for linking up to Kids Get Crafty! Much appreciate your visit! Very Cute ~ Thanks for linking up with Fun for Kids Friday! That is so cute. Thanks so much for linking up to Winter Blues Wednesday. Lovely work, keeps kiddos really bsy. Thanks for linking in our carnival. These are so fun! My kids would love to make these. What very lucky children to not only get those wonderful handmade valentines, but one of your whimsical pencils too! Wow!!! thanks for linking in.. these are sooo cute! Saw you at the Imagination Tree today. I know this is from LAST Vday but they deserve bumped up for this year too. So adorable!! Ok - yep, gotta go out and get that book today!! This is super cute! Do get it Deborah! The kids will love it!